January 22, 2019, Ivyland PA - DDM Novastar Inc will launch its new NovaScope Semi-automatic Optical Inspection System (SOI) at IPC Apex EXPO 2019 in San Diego (Booth 1633, January 29-31, 2019). The NovaScope SOI System offers a ‘best in class’ solution that bridges the gap between manual PCB inspections and fully automatic AOI machines. This new versatile system offers fast and easy programming, automatic reporting, automatic photo documentation, reduced operator fatigue and optional side viewing. The NovaScopeinspects and archives images of printed circuit board assemblies. It significantly increases the speed and accuracy of manual visual inspections, and it comes at a fraction of the price of a fully automated AOI. Programming can be done in a matter of minutes using the integrated Gerber, XY Placement List, and Bill of Materials import features. There is also a utility for simple matrix type scanning and inspecting of the board. Inspection area sizes range from 18” x 12” up to 24”x 18” and offer optional side view capability for oblique viewing in 8 programmable positions around each component. The system automatically moves a digital microscope to the inspection points, sets the lighting, camera height and angle, zooms to the region of interest, and displays a live image of the inspection area. The system displays a golden board image for visual comparison. The images are automatically captured and can be stored as part of a post inspection report. The inspection can be done by component, by board region, or by a combination of both. Inspections can be performed for many reasons: verify part presence, rotation, polarity, registration, text, solder, solder paste, bent leads, bent pins, jumpers, cut traces, or any other top down or side visual feature on the PCB. 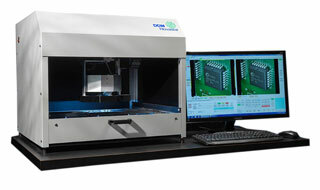 Available Options: In addition to options enhanced microscopes, and views, the systems can be configured as desktop unit or floor model, drawer or SMEMA conveyor, manual or programmable width control.